one of four installation views. This show, called "Schornsteinarbeit" (Chimney Works), was dedicated to chimney themed works and had an important catalogue, prepared to be a source work regarding this area of work. Texts by Claudia Büttner, Kay Heymer, and JS. 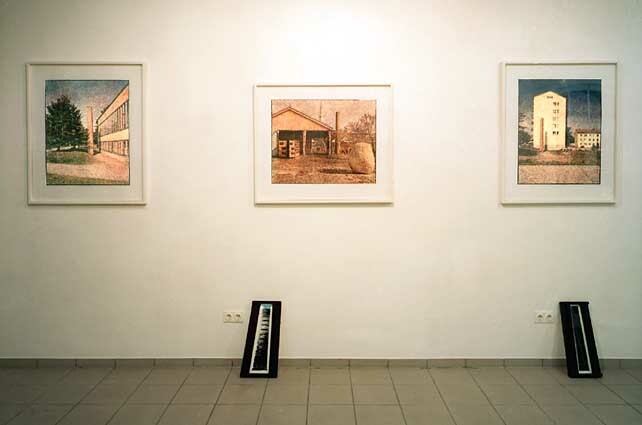 On the wall: the three colour woodcuts (left to right) "First Chimney - Stockholm", "Second Chimeny - Taejon," "Third Chimney - Kotka", (1996-1998). On the floor: two out of the Chéminees d'Ivry from1989.